Battleships isJagathon’s event held in conjunction with Regatta Week, located in the IUPUI Natatorium Competition Pool. Battleships is a wet and fun team challenge where teams combine skill, balance, creativity, and school pride into an all-out water fight in the IU Natatorium. 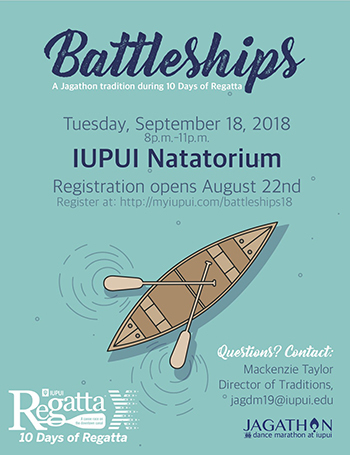 Teams will use buckets and other water throwing and blocking devices to sink an opposing team’s canoes while remaining afloat to be crowned the IUPUI Intramural Battleships Champion. Teams will consist of 3 people per-canoe and an alternate with a goal of sinking the other team’s canoes while staying afloat themselves. Battleships Qualifications and Finals take place September 18th, 2018 from 8:00 p.m. to 11:00 p.m. in the IUPUI Natatorium. Are you competitive? Do you like building things? If so, then the Cardboard Boat Competition is for you! Tap into your creative, critical thinking side and construct a boat to find out if you have what it takes to win! Sign up today and may the oars be ever in your favor! Registration is open and closes after the first 10 teams have registered. Each team must consist of two paddlers who are IUPUI students, or alumni, and are over the age of 18. Each paddler must complete a Release and Waiver of Liability Agreement form the day of the event before participating. All paddlers must wear personal flotation devices (PFDs), which will be provided. All paddlers must be properly attired to participate. No clothing shall be worn that displays profanity or obscene language. Please come dressed appropriately. The boat must meet all rules found below or it will be disqualified. Each team is responsible for obtaining their own materials. Teams may bring cut milk jugs to bail water. Teams must create their own paddles with the acceptable materials found below. Teams are responsible for disposing of their boats after the race. If you are unable to participate for any reason, you have until Wednesday, September 19, 2018, to unregister and your deposit will be refunded. If you are a no-show the day of the event, your deposit will not be refunded. The boat must be constructed before the race day. The boat must have sides. The top of the boat may not be enclosed, which would prevent escape. The competition will test speed and maneuverability. Teams will need to complete two loops around the south end of the canal. Contact with other boats is discouraged. Aggressive contact may result in a penalty or disqualification. Judges reserve the right to apply an additional penalty if it is warranted based on any other behavior that threatens the integrity of the event. Registration will close after the first 10 teams have registered. Awarded to the team that may run into a couple of problems but never gives up. Awarded to the boat that is the most entertaining to watch. Do you have a dog? Are you creative? Then we want YOU to enter your dog in our dog costume contest! Registration will close after the first 20 entries are completed. Registration will be done onsite between 10:30 a.m. and 12:30 p.m. and will close after the first 20 entries are completed. Dogs must be registered by 1:00 p.m. to participate. One form per dog. All dogs must be leashed at all times and under the control of the accompanying owner. Owners are responsible for cleaning up after their own dog if needed. You and your dog must be comfortable in a highly social environment. Children 12 and under with a dog in the contest must be accompanied by an adult. The IUPUI Regatta will provide water stations for your dog. One member of your group must check in at the registration table located in the information tent in the center of Military Park between 12:00 p.m.–1:00 p.m. to register. Participants must be lined up and ready to go no later than 1:20 p.m. near the stage. Owners and pets will be required to walk across the stage located in Military Park and then wait until all contestants have completed their course. Contestants must be sure to stay for the entire length of the contest in order to be eligible for a prize. Best of Show is the prize-winning category and will be decided based on overall scores. Prizes will be awarded to three dogs for Best of Show, based on their overall scores. First, second, and third place will receive gift bags with various dog care supplies and toys. Most creative will also receive a gift bag. Show off your IUPUI Regatta pride as well as team spirit by participating in the 2018 Regatta Team Theme Contest! This year, we want you to show off your enthusiasm for Regatta by having your team dress in a theme of your choice! Creativity is of the essence, and for those who are struggling with a theme idea, we have made a list of brainstorming ideas for you! Must include team name or the school/organization you are representing. Please refrain from using material that may fall off. Winners will be announced the day of the Regatta, Saturday, September 22, 2018. All 200 teams rowing in the 2018 Regatta are eligible to enter the Team Theme Contest and will be judged by members of the 2018 Regatta Steering Committee. Sports teams, movies, childhood tv shows, bands, styles of generations (50’s, 70’s, etc. ), & video games! If there is ever a time to play tug-of-war in the water, now is as good a time as any! This canoe-based event will be beginning around noon on race day, Saturday, September 22, 2018. There will be 3 divisions, consisting of 10 teams total per division. Divisions include Men, Women, and Co-ed. Be sure to view our social media (Twitter, Instagram, Facebook) accounts for a demo of this race. Registration will open on September 4, 2018, and close after 10 teams have registered for each division. A $30 fee will be due at the time of registration. All paddlers must be properly attired to participate. No clothing shall be worn that displays profanity or obscene language. Closed-toe shoes must be worn when in the canoe. Please come dressed appropriately. Paddlers must arrive no later than 10 minutes before their heat start time on the day of the competition, September 22, 2018. The competition will test each team’s strength and endurance. Teams will compete in a randomly generated double elimination bracket competition. A new heat will start every 15 minutes. Each team will be assigned a start time and must arrive 10 minutes before that time. If you are also competing in the 2018 Regatta canoe race and your start time conflicts with your heat for the race, please contact Ian Park at irpark@iu.edu. Two matches will be occurring at one time. Splashing other teams, purposefully tipping the canoe, and trying to make contact with other canoes is not permitted. Any of these may result in a penalty or disqualification. Medals will be awarded to the first and second place teams from each division.